The Spring Fling is an annual City of Bloomington event that encourages families to get out and play. Kids can ride in a Zorb ball, play a giant game of Connect Four, try aerial silks, and much more! 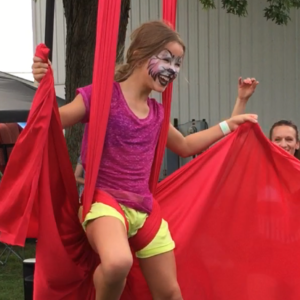 During the Spring Fling, Aerialogy students under 13 have an opportunity to show off their aerial skills for family, friends, and other guests in an animal-themed performance. Students can select any animal they would like to be in our Menagerie, and we will provide Ben Nye face paint for that animal. Both solo and partner routines are welcome! Costumes: Kids are encouraged to wear their Aerialogy leotards (available in our gift shop) or can design their own aerial-safe costumes (no zippers, buttons, metal, or loose fabric) with parent and instructor help. The Spring Fling is a ticketed event. Your student’s entry is covered, but please budget $3 admission for family and friends. The Children’s Expo offers an afternoon of interactive games, activities, and crafts provided by local businesses and organizations. Aerialogy is an official sponsor of the Children’s Expo and will feature basic aerial lessons for kids of all ages, along with our signature dazzling performances. Invite friends and family to see your student perform a solo routine with a classic circus feel. 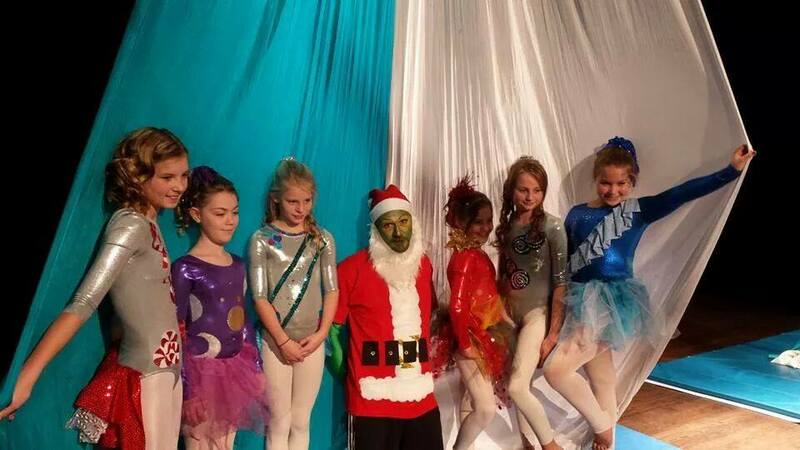 Students wishing to perform at both events must have two separate routines and register for both events, but can use discount code CIRCUSMONKEY to save 20% off of the total price ($20). Aerial rehearsals will run every Saturday evening from August 4 through September 29. Session A rehearsals run from 5pm-7pm. Session B rehearsals run from 7pm-9pm. Participants must attend all practices unless written permission is granted by the directors. Mandatory tech/dress rehearsal is at 3pm on and Friday, October 5. Rehearsal fee does not include costume, hair, makeup fee (participants keep their costumes). Ilsa Greatorex-Duncan is here to expand your lyra vocabulary! She’ll be introducing new drops and tricks to add to your repertoire including Top-to-Bottom Drop, Belly Drop, Penny Drop, Magic Trick, Shoulder Balance, Skinny Cat Splits, and more. 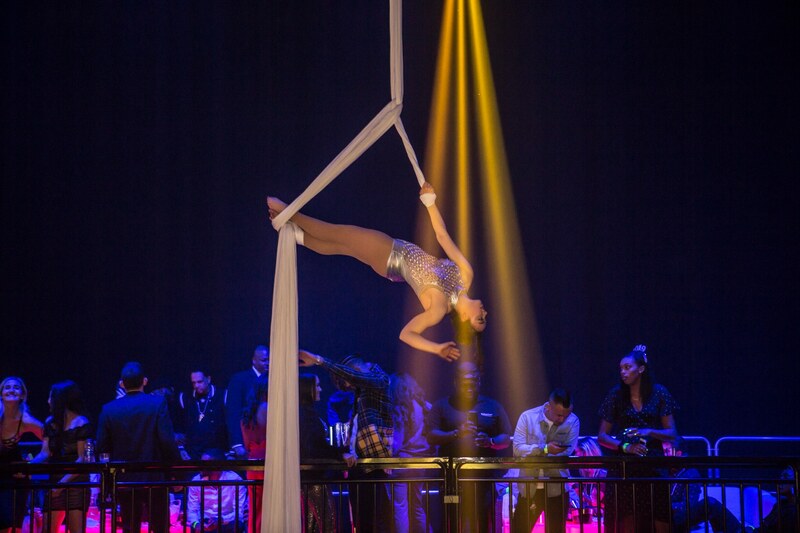 Explore the nature of spinning and how it affects your movement in the air as well as incorporating beat and conditioning exercises preparing you for your next level of aerial dance. If attending both Oct. 6 workshops, use code ILSA10 at checkout to save $10 off the total price. Misuse of code will result in a charge to your account and/or removal from the workshop. Visiting professional Ilsa Greatorex-Duncan will help develop your aerial choreography skills. Find the arc of your journey into the air, play with structure, character, and flow. Attention is given to somatic awareness, while enjoyment of the artistic process and individual expression is prioritized. 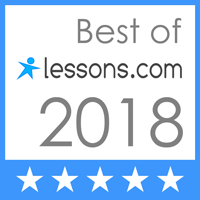 We will experiment with technique, transitions, intention, how music inspires different qualities of movement, and finding the true style and journey of your own performance. You are welcome to bring any ideas to the table, this workshop is to help you create your vision and to have fun while you’re at it! Pre-requisites: To participate please have a piece of choreography prepared to work with. The piece doesn’t need to be finished. If attending both Oct. 6 workshops, use code ILSA10 at checkout to save $10 off the combined price. Misuse of code will result in a charge to your account and/or removal from the workshop. 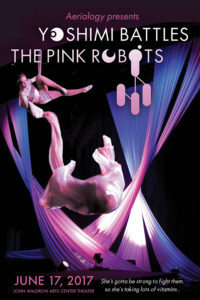 Join us in Aerialogy’s summer showcase, an original aerial production of Yoshimi Battles the Pink Robots! The performance will be Saturday, June 17 at 7pm at the John Waldron Arts Center theater. Kids & adults, boys, girls & robots of all levels are welcome to show off their moves in fantastic costumes to a killer soundtrack. 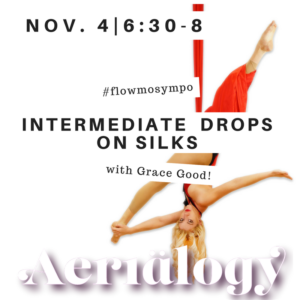 We’ll feature solo, duo, and trio silks and lyra routines. Rehearsals will run 6:30 – 8:30pm each Friday evening from April 28 – June 16 with dress rehearsal the afternoon of the 17th. 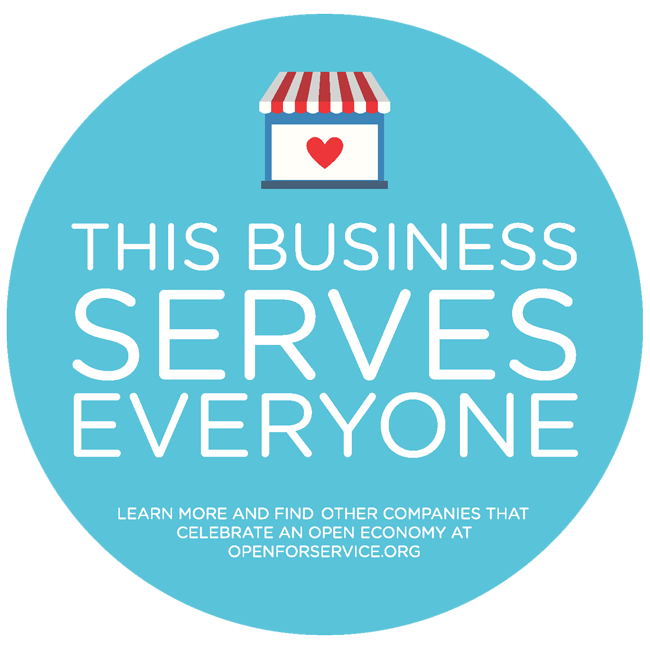 This is the perfect opportunity to show off everything you’ve learned to family and friends! 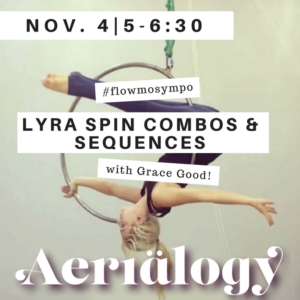 This workshop will be focused on spinning and learning/creating combos and sequences all while gracefully spinning and transitioning on the lyra. We will be working on combos from inside the lyra, top bar, and from drops all while remembering control, body formation, and posture. FlowMotion Symposium 2016 ticket holders get $10 off! In this workshop we will be exploring intermediate level drops. Adding on to simple star drops and hip key drops, as well as exploring other types of thigh hitch drops and belay drop sequences and creating combos all while remembering body formation, posture, and technique. This aerial silks workshop requires an intermediate knowledge of aerial skills. Prerequisites include 6 months of previous aerial training, must be able to comfortably invert and hip key. Have your audience sitting on the edge of their seats! This intermediate level workshop focuses on bringing show-stopping technique and bold movement to new and favorite drops. Krystyn teaches empowerment and confidence to anyone from complete beginners to advanced students in a safe, fun, and encouraging environment. She is a highly skilled and qualified instructor in Aerial Fabric, Pole Fitness, and Exotic Dance. The performance workshop will progressively prepare you for an aerial routine and dance that will be debuted at the Aerialogy Winter Showcase. 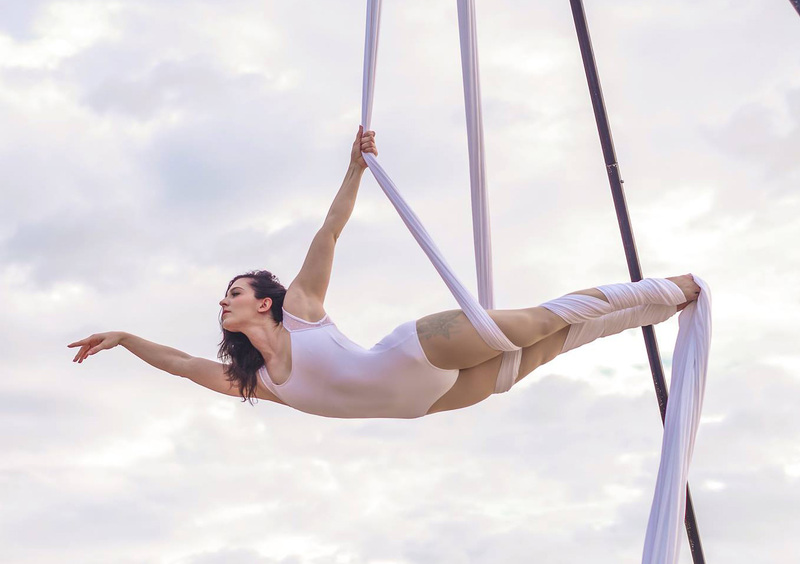 Participants must be currently enrolled in aerial classes package to perform, and must attend 6 performance workshop sessions, private or semi-private lessons in order to prepare for this event. An additional costume expense of up to $75 will be required. Workshops will be at Twin Lakes Recreation Center on Saturdays in November and December.